Today at lunch I went for a hot bowl of Tuscan White Bean Soup from the cafeteria at work. Our cafeteria went through a remodel last year and actually serves some pretty decent food. The soups have always been great but this one was extremely underwhelming. Not necessarily bad but really not good in any way. I even had to go get a big side of onion rings to make up for it. So on the way home I decided I'd make my own version. Because I was still craving soup and I knew I could do better. I also need to start making more dinners that I can take for lunch the next day. I used to be so good at bringing my lunch with me but with the remodel I'm now used to buying lunch every day. If I keep making soups like this one though, I should be in good shape. Can't say the kids absolutely loved it but they still ate it without too many complaints. Typically if I tell them it has bacon in it, that helps them get started. I'm sure that works on everybody. Honestly, I have no idea what makes this a Tuscan soup but the recipes I adapted them from were all named Tuscan so I'm sticking with it. 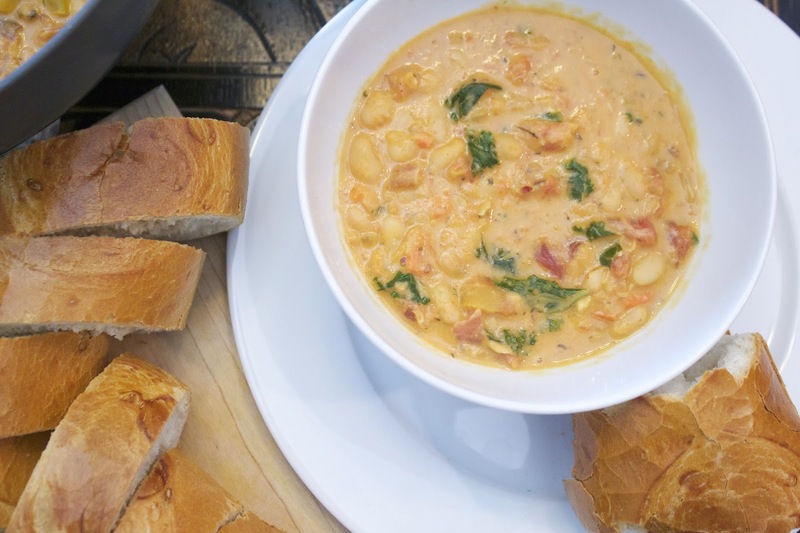 This is an easy one to throw together on a week night and enjoy for the next day or so. It could easily be doubled too and frozen. Play around with the herbs and come up with some different flavor combinations of your own. 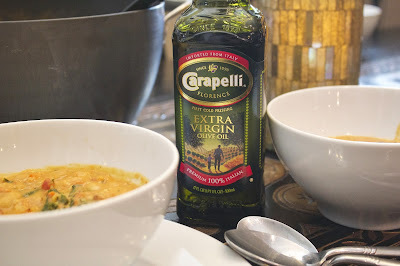 The Virtual Potluck team is working with Carapelli Olive Oil and I'm even giving away three bottles of their great Olive Oil. See the bottom of the post to enter! I used the olive oil to saute the vegetables and then drizzled some over the finished soup for some additional flavor as well. Their original olive oil has a great flavor and can be used on so many different things. If you're interested in more recipes using their olive oil check out their recipe page. In a large pot over medium heat, sauté the first four ingredients in 2 tablespoons of the olive oil for 5 minutes. Add the tomatoes and their juices, along with the beans, broth, and rosemary. Simmer, covered, until the beans break apart, about an hour. Add the kale, bacon and cream and cook for 5 to 7 minutes more. 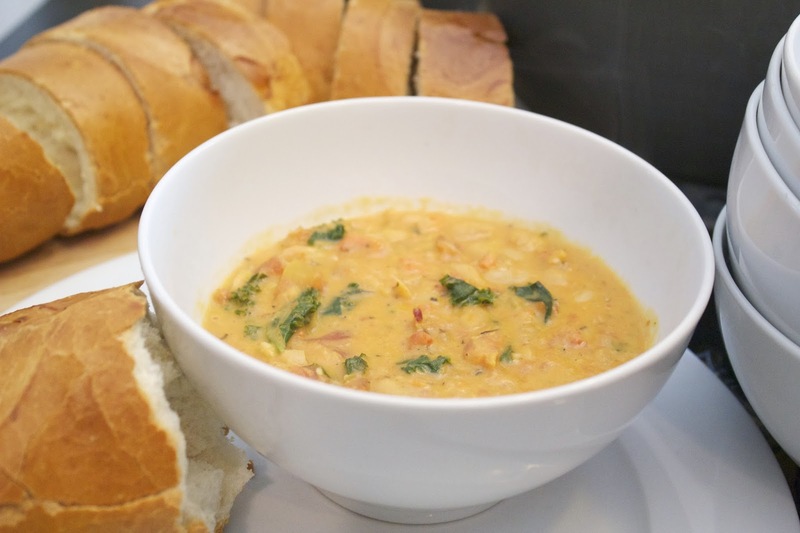 Using an immersion blender, blend the soup to the desired consistency. You can also place a portion of the soup in a blender and then return to the pot. Serve drizzled with the remaining olive oil and sprinkled with the cheese. What a great way to sneak in some kale. I could sure go for a bowl of this soup right now! I'm going to make this, sounds really good. 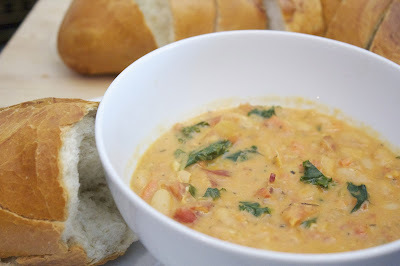 I want to cook claw chowder in my slow cooker! I love to make roasts in my slow cooker! I love white bean and kale soup. This has me drooling Matt! Awesome!